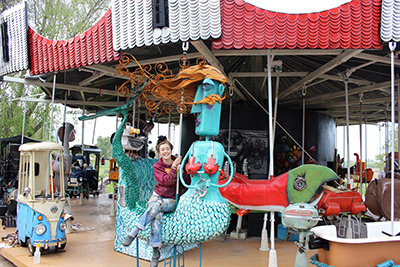 For a free and fun outing this weekend, head to Sebastopol to visit the junk sculptures of Patrick Amiot and Brigitte Laurent. Made out of scrap or recyclable waste, these cartoon-like creations are sure to put a smile on your face. Rocket ships, monsters, mermaids, fishermen and pirates will spark your environmentally conscious imagination as you look closer to see what they’re made of. It’s hard not to laugh when you realize a caterpillar’s feet are made out of forks or that the nose of a girl is really a wrench. Pots are repurposed as hats, clocks become eyes. “People think it’s funny to see pots and pans put together,” Amiot said about their creations. In a few months, something new and unusual will be squatting in the streets of Sebastopol—a 10 foot tall junk sculpture of an orange tabby cat saying, “Slow down!” Amiot was commissioned by the Sebastopol Police Department to create the cat. It’s trailable, so it can be moved to different locations. It will be lit up at night. For Amiot, it’s all about recycling. He tries to recycle as much as he can. “I started to be peeved that I couldn’t use materials that were there,” Amiot said. He felt so strongly about this that he made the switch in 2011, letting go of the clay and bronze materials he worked with. From that point on, he only worked with reusable existing materials, such as steel and found objects, scrap and other recyclable waste. The husband and wife team describe themselves as urban folk artists, using bright bold colors and highly decorative design. Patrick sculpts; Brigitte paints. The artists use the beauty of their surroundings as inspiration—the colors, countryside and people of Sonoma County. One of his latest projects was making a carousel out of recycled materials. Those riding on the carousel can choose to sit on a crab, a moon, a phone, a chicken, a bumblebee or a fish, to name just a few. Plus, the carousel is solar powered! Talk about reusing, reducing and reinventing! This carousel is currently being prepared to be moved to Markham, a city near Toronto. It’s easy to view these sculptures. You can get a map by visiting http://patrickamiot.com/visit.html and downloading the Sculpture Tour WebApp optimized for smartphones. In Sebastopol, you’ve probably seen the ambulance sculpture at Palm Drive Hospital or the tiger mascot at Analy High School. On Main Street, a sculpture of a bicyclist reminds residents to choose eco-friendly modes of travel. Dotting Highway 12 is the Big Bad Wolf Train, the Jersey Cow and Maureen the Dog. If you drive down Florence Avenue, you’ll see at least 20 sculptures, one in almost in every front yard. There’s Grateful Bird, Legend of Kootney Joe, Darlene the Waitress, Babe Ruth, Batman, a rat riding a hot rod, and a truck with a cow in the flatbed. More and more people are making a difference for our planet as they practice the 3R’s (reduce, reuse and recycle). But have you heard about the 5 R’s? That’s reduce, reuse, recycle, rot (compost) and reinvent. The reinvent part is making art out of waste. For example, students at the school I teach at, Monte Rio Union, recently created a sculpture called “Bunny Rubble.” It’s made of marine debris collected from the Russian River Estuary and from the beaches of Sonoma Coast. The bunny is on a revolving display at the Jenner Visitor Center. For more information about Amiot and Laurent, visit http://www.patrickamiot.com or call Big Times Art Studio at (707) 824-9388. Last week, the entire student body of Monte Rio Union School went on an African safari— without ever leaving Sonoma County. They went to Safari West, a 400 acre wildlife preserve for over 900 exotic mammals and birds, located off Mark West Springs Road. (It takes just 15 minutes to get there from downtown Santa Rosa!) The adventure was made possible for kindergarten through eighth grade students by the Safari West Foundation, an educational component of the company that teaches conservation through education. The company is dedicated to raising awareness of exotic animals, promoting understanding through in-person contact, and to the propagation of endangered species. Each year, over 10,000 school children visit the preserve on field trips! Each year, 60,000 visitors experience the thrill of seeing the exotic animals in-person. I have the privilege of teaching at Monte Rio Union School and went on the field trip as well. Around the grounds of Safari West, you could hear “oohing” and “ahing” as students pointed at giraffes, gazelles, zebras, oryx, antelopes, cape buffalo, wildebeests and cheetahs. I was lucky enough to see this! We were on the tram tour, passing the giraffes, when one came up and tried to kiss our guide, Corrine Bishop, on the cheek! (At least, that’s what it looked like it was trying to do!) Bishop moved away, and the giraffe licked her hair. Bishop is the Events Manager for Safari West. When she heard that the Monte Rio students were going to visit, she jumped at the chance to volunteer to guide our students during the tram tour. Bishop was once herself a student at Monte Rio during her eighth grade year, from 1994-1995. It was the first year of the new Monte Rio School building. Bishop began as a volunteer in 2008, fell in love immediately and never left. She was hired in 2008, and is getting ready to celebrate her six years of employment in August. It is Safari West’s belief that the more children know about animals, the more they appreciate them and want them to be around for the future. 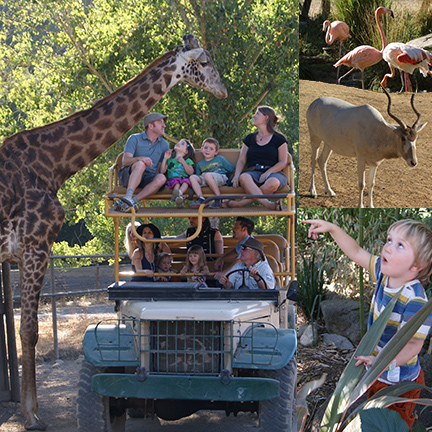 Safari West was rated by AAA as a must experience location in California, second only to Disney Land! Sunset Magazine has listed it as one of the top 300 destinations in the western United States. To book a tour or learn more about the animals of Africa, visit Safari West at http://www.safariwest.com or contact them at (707) 579-2551. 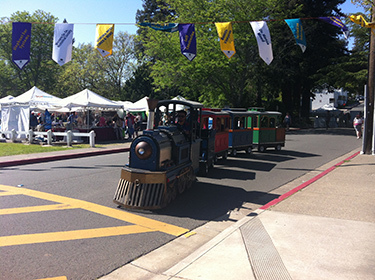 For a unique family outing this Saturday, April 26, head to Petaluma for the 33rd Annual Butter & Eggs Days Parade & Festival. You’ll get to participate in the celebration of Petaluma’s heritage, enjoy local food, shop arts and crafts, have fun with the kids, and more! At 11:30, the Clover Kids’ Parade will begin, followed by the Main Parade. Afterwards, you can enjoy El Dia de los Muertos pre parade entertainment and live music at the Riverfront Stage with Bad Neighbors. Beer gardens will offer local beer.
. Crowley also organized the Pub Crawl, a quarterly event that leads participants through the city’s historic buildings and streets, as well as restaurants, galleries, taverns, shops and back alley artist spaces. The Petaluma Downtown Association provides yet another community building component during this festival. If you wear a 2014 Friends of the Parade button, you will benefit from specials at local businesses, such as a free appetizer at Buffalo Wild Wings, two for one tastings at Enriquez Estate Wines, or free hair glitter at Lions & Tigers & Hair. Buttons are $5 and are available at local businesses like Aqus Café and Petaluma Market. Petaluma Transit offers free rides all day. 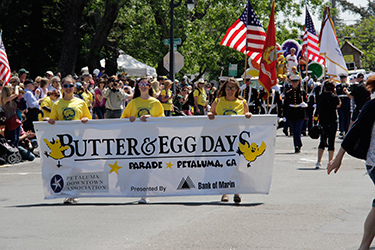 For more information about Friends of the Parade buttons and festival schedule, visit http://www.petalumadowntown.com/butter-and-egg-days-parade.html. e. We plan on returning every year. This festival is for everyone, and especially delightful for families. Attendees enjoyed a parade of over 100 entries (from floats to horses to electric vehicles) and danced to the bluesy groove of local talent and legends. With 85 exhibitors, you could get almost anything you craved. My husband and I chose falafel and Lagunitas beer (who knew what a great combo that would be? ), and finished it off with a dessert of kettle corn. For those who preferred first-rate local wine, Balletto Vineyards, Gary Farrell and Harvest Moon were pouring, to name just a few. The food options were diverse, such as homespun organic cotton candy, gourmet corn dogs, Frozen Art Ice Cream and Thai Kebob BBQ. If one’s dream was to shop local crafts and creations, that was provided too. kids area included mechanical bull rides, carnival games, super bounce houses with giant slides, a train and a pirate ship that swung like a pendulum. A small-scale petting zoo completed the kid fun, with chickens and chicks, ducks, baby turkeys and goats. The playgrounds at Ives Park were also full of children playing. It was sweet, watching the kids play while the parents swayed to the blues. Everyone got into the groove—grandparents dancing with children, couples dancing with each other. 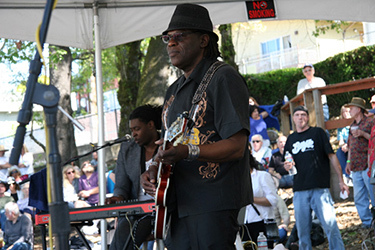 Live music was performed on two stages. My husband and I were lucky enough to see Joe Louis Walker (Blues Hall of Fame member and participant in Grammy-winning records by B.B. King and James Cotton) and local Forestville celebrity David Luning (American Idol alum). During the festival, attendees also got to groove to the Grammy-nominated band Frobeck, award-winning blues artist Janiva Magness and other great local musicians. Near the end of the festival, my husband and I sat on a bench in the shade, listened to the mellow crooning of David Luning, and watched a child and his mother spin each other in a two-step dance. It was a perfect way to end a lovely festival. At Bodega Head, whales are spouting and breaching. At Jenner, the seal pups are rolling around to show off how cute they are. Flowers are blooming, gardens growing so fast we can almost sit and watch them get taller. At times, the birds are so loud they’re deafening. As we experience bliss in Sonoma County along with this fabulous weather, it’s time to dust off that picnic basket. Wonder where to picnic next? And here’s some of our favorite places to pick up picnic food! This market is more than just a grocery store. Community Market offers local, organic and wholesome food, as well as the chance to make community connections. It also provides a 100% organic produce department! With markets in Santa Rosa and Sebastopol, there’s one close to most residents of Sonoma County. The newer Sebastopol location is situated in The Barlow. If you haven’t visited this community yet, you’re in for a treat. Not only is there access to quality local goods, but you get to meet the artisans and makers themselves. At the Community Market’s location at The Barlow, you can also relax in a wine and beer garden! For farm fresh produce, food and local wines, visit the Dry Creek General Store. It offers a large selection of artisanal meats, cheeses, crackers, jams and hand-made treats. To complete the perfect picnic, the store sells wine, of course. At the deli you can buy delicious sandwiches like the Imported Mortadella, as well as soups and salads. In the heart of Alexander Valley, Jimtown offers homemade food, unique condiments and wine too. It has been featured in publications such as USA Today, The New York Times and Better Homes and Gardens. Plus, they offer boxed lunches. When planning a picnic, sometimes these two words can be magical (aka, no preparation)! Hours: Monday-Friday 9:00 a.m. – 5:00 p.m.
Saturday, Sunday 10:00 a.m. to 5:00 p.m. Visiting Kozlowski Farms is like stepping back to the 1950s and into the kitchen of founder Carmen Kozlowski. At this family-owned farm and store, they still make Carmen’s recipes, like her Gravenstein Apple Pie. In 1984, Carmen made her raspberry bread with Julia Child on Good Morning America. In 1997, Carmen received the Sonoma County Lifetime Achievement in Agriculture Award. Kozlowski Farms has been named an area destination on the PBS program: “California Heartland” and KRON-TV’s “Bay Area Back Roads. Although perhaps most famous for pies and jam, their Russian River Valley store offers much more. Think fruit butters, chipotle grilling and dipping sauce, chutney and marmalades. Plus, they also make a boutique-production Pinot Noir! Gourmet award-winning food, box lunches and wine! 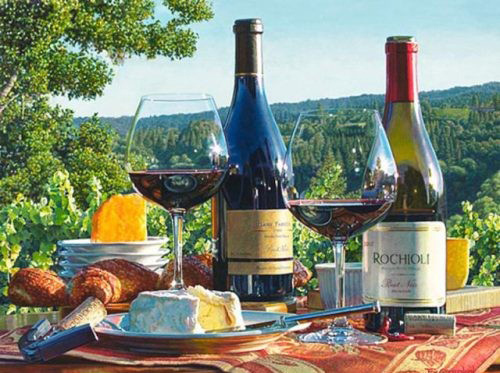 At Korbel, you can wine taste, select your picnic wine or champagne, and buy plenty of local artisan cheese, bread, and sweets for a great picnic. My favorites are the Roasted Turkey Breast sandwich (with their special cranberry chutney) and the Grilled Marinated Eggplant sandwich. For something sweet, I recommend the organic lemon curd from Forestville. It’s fabulous with a baguette or just plain, on a spoon! This spread has been a hit every time I’ve brought it to potlucks. But beware—with patio seating near a fountain, a view of the vineyards and redwoods, you may not want to leave! For box lunches, pre-order at least 24 hours in advance by calling 707-824-7708, Monday-Friday 8 am – 4 pm. Hours: Monday & Thursday 11 am – 5 pm. If you’re already headed out to the coast, and have passed Guerneville, no worries! At Sophie’s Cellars you can pick up picnic items such as local artisan cheese (Cowgirl Creamery and Humboldt Fog! ), gourmet crackers and local fine wine. What’s the perfect finish to a day of savoring wine? Chocolate tasting, of course. A couple of Sundays ago, my husband and I were in Sonoma. (We had just taken our biplane ride.) After doing some wine tasting, we visited Wine Country Chocolates in Sonoma Plaza. The shop offers free daily chocolate tastings of ganache (the inside of a truffle) and three kinds of chocolate. The chocolate shop models itself after the way a wine tasting room is run. As you sample, you learn. They even have a Truffle Club, in which patrons receive a personalized selection of chocolates each month. We tasted the Cabernet Sauvignon ganache; it melted in our mouths like a cloud of rich, luxurious silk. Wine Country Chocolates creates a ganache from blended Guittard and Sharffen Berger chocolates, fresh dairy cream and butter. I bought 12 truffles and a 1.1 pound 91% cacao Guittard chocolate bar. All the chocolates are free of preservatives and waxes. What am I going to do with a huge square of dark chocolate? Lots of things—bake with it, create shavings for the top of desserts, and melt it into a spicy sipping chocolate drink. Wine Country Chocolates began when Betty Kelly and her husband bought a truffle-making operation in 2000. Now it has transformed into a successful mother-and-daughter chocolate company. Betty Kelly partners with her daughter, Caroline, in running the chocolate shops in Glen Ellen and Sonoma. In Glen Ellen, you can watch the chocolatiers make the ganache—forming, pressing and enrobing it in dark chocolate. It was hard, but when I returned home, I decided to share the truffles with my 18-year-old son. Within four days, we had polished them off. They were irresistible! I especially loved the vintner-inspired ones: Cabernet Sauvignon, Zinfandel, Port, Champagne. The Pomegranate with Orange Blossom Honey was incredible. But hands down, what was our favorite? The Cappuccinno-Tiramisu, a blend of coffee with one of the best desserts ever! It turns out, others agree. This truffle is a best-seller. 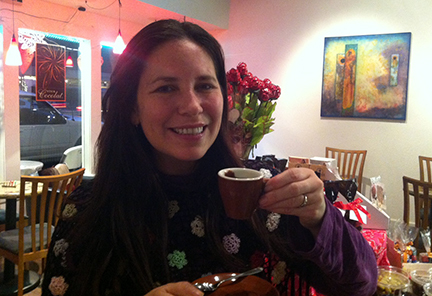 “Sometimes you have a recipe that comes together perfectly,” Kelly said of the Cappuccinno-Tiramisu. “I can’t keep those on the shelf,” Kelly said. Another favorite is the Caramel Rocky Road. Again, simple rich ingredients complement each other—almonds, marshmallows and chocolate, drizzled with caramel. Experience the chocolates for yourself at either the Glen Ellen location (14301 Arnold Drive, Glen Ellen) from 10 am to 5 pm daily or in Sonoma (414 First Street East, Sonoma) from 11 am to 5 pm daily. You can buy their Wine Country Chocolates at the shops or online. Visit https://www.winecountrychocolates.com or call (707) 996-1010. As Earth Day approaches next month, let’s remind ourselves that every day is Earth Day. Take time to connect with nature. Plant a tree. Climb a tree or sleep under one. Think of all the gifts that trees give us, even obscure ones like shampoo and toothpaste. Think of all the gifts that the flora and fauna of Sonoma County give us year-round. 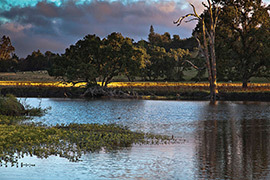 One of the best places to connect with nature is at the Laguna de Santa Rosa, a wetland complex 14 miles long that drains a 254 square mile watershed, encompassing most of the Santa Rosa Plain. The Laguna is home to perhaps the richest wildlife of Sonoma County. Hundreds of bird species make this a bird watcher’s paradise. Bald eagles nest here, and have raised more than a dozen of their young. In this biologically diverse habitat, you can also find mammals like mink, badger, bobcat and river otter. Flora is varied and rich (think Sebastopol meadowfoam and Lob’s aquatic buttercup). The best trails are family-friendly, dog-friendly and free. The Laguna de Santa Rosa Trail boasts views of the Laguna, vineyards and Mount Saint Helena (1.8 miles). The Joe Rodota Trail runs alongside agricultural ranches and the Laguna, connecting Santa Rosa to Sebastopol. It unfurls golden fields of mustard at the end of winter and promises paradise for bird watchers year-round (8.47 miles of paved trail). The Laguna de Santa Rosa Foundation is doing their part for the planet with a Re-Leaf Day event on April 5th. Instead of walking miles, volunteers will plant trees. During this “tree-a-thon,” volunteers will plant 600 native trees to restore the riparian cover along Irwin Creek. Each of the 80-100 volunteers has raised money for the foundation. The restoration will improve the health of the wildlife habitat, as well as improve air and water quality. If you wish to donate your time, and get rid of any lingering Nature Deficit Disorder, join the Laguna Keepers on Saturday, May 3. During this event, volunteers will install Dri-Water gel pacs and maintain the native plantings. Families and volunteers of all ages are invited. A new Laguna Keepers schedule will be posted in mid-summer with 2014-2015 dates. 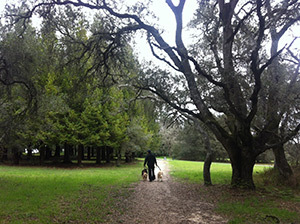 For the Spring-Summer Public Education schedule, visit http://www.lagunadesantarosa.org/laguna_walks_classes.shtml. For more information, visit http://www.lagunadesantarosa.org or call (707)527-9277. As a Sonoma County enthusiast, I thought that I had done it all. I’ve ziplined, kayaked through bioluminescence, hiked, wined and dined. But last Sunday, I experienced a thrill of a lifetime. If your bucket list doesn’t include “Fly in a Biplane,” then I recommend adding it today. 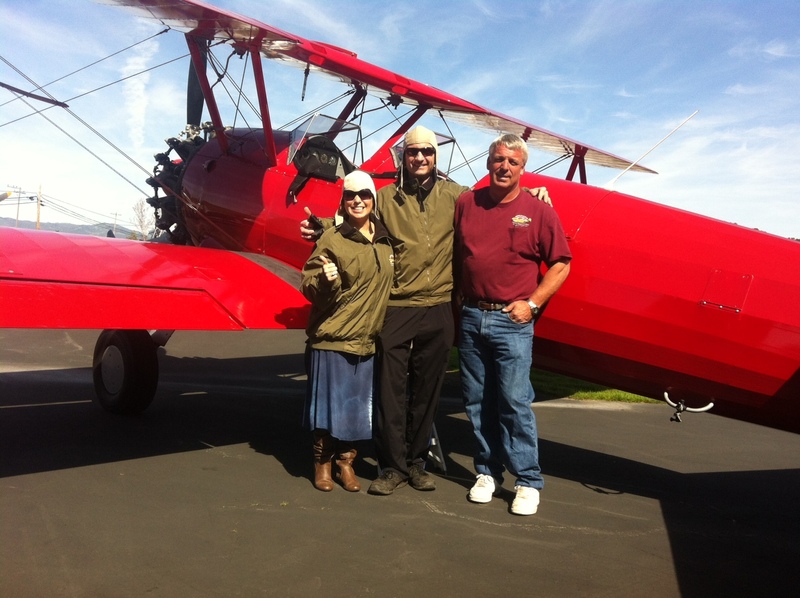 My husband and I returned to the Golden Age of flying with help from the Vintage Aircraft Company at the Sonoma Valley Airport. For 20 minutes, we saw Wine Country from the open cockpit of a 1942 Boeing Stearman Biplane. After choosing the Sights of Sonoma Tour from the company’s flight menu, we strapped on our flying helmets, secured our sunglasses, and walked up the wing to climb in the open cockpit of “Big Red.” (This type of plane was the first aircraft a cadet would fly during flight training prior to and during WWII.) Our ace pilot Chris Prevost climbed in behind us. The propeller began to spin and before we knew it, we were up and away. At one point we were nearly 2,000 feet high, flying 140 miles per hour! Even then, the flight was totally comfortable. The aircraft company calls it a “convertible in the sky,” and they are right. I had no doubt I’d be able to wine taste the rest of the afternoon. The biplane flew over the lush hills and vineyards of Sonoma and Napa county. We even saw the Richmond-San Rafael bridge rising through the distant fog. In addition to the Sights of Sonoma tour, the company offers a 40-minute Explorer Flight with options of the “The Wine Country Tour,” “West to the Pacific” with bay and ocean views, and “Spires of the City” with views of the Golden Gate Bridge and Mount Tamalpais. I’m altering my bucket list to include “Aerobatic Maneuvers in a Biplane.” The company offers this too! I definitely plan on returning with my daredevil helmet on. Next time I will ask for all the maneuvers offered—the famous Cuban Eight, the Hammerhead, Aileron Roll, Point Roll, and Barrel Roll. Not many people get to say they’ve followed their dreams and are now living them, but pilot Chris Prevost can. When he was 13, he discovered a P-40 Warhawk at Sonoma Valley Airport. That’s when his love of historical aircraft began. When he was only 16, Prevost acquired his pilot’s license. At 17, he began aerobatic demonstrations at West Coast Airshows in his Bellanca Super Decathlon and vintage Boeing Stearman. When he was 19, he obtained his commercial pilot’s license. Prevost has flown more than 75 different aircraft, and has flown for 35 years. He founded the Vintage Aircraft Company in 1980. A few years later, he founded the North Bay Air Museum as a flying museum. Now he and his wife own the Sonoma Valley Airport. Here’s the story: During WWII, the Warhawk was piloted by American war hero Major Ray Melikian of Visalia, California. When flying over Papua New Guinea, the plane was riddled with bullets. But it still flew. Later, when it was landing in Australia, it crashed into an Allied aircraft. That was the end of the P-40 for decades; it was pushed into the weeds and forgotten. However, when the plane went to auction in New Zealand, Prevost saw his chance to own a P-40 and bought it. He flew there, packed up the bits and pieces in a container, and shipped it back. From 2000 to 2009, he worked on the P-40 every day, before and after work. Now the Warhawk shines in its new home at Sonoma Valley Airport, restored to all its former glory. For a weekend flight, arrive at the airport between 10 am and 5 pm (no appointments taken). On weekdays, flights are scheduled by appointment, weather permitting. (The company is closed Tuesdays and Wednesdays.) The airport is four miles south from the town of Sonoma. For more information, call the Vintage Aircraft Company at (707) 938-2444 or visit them at www.vintageaircraft.com. Snuggling with your dog is great, but experts say that it is during the walk that you form the real relationship with your canine. With this incredible weather, spring flowers almost emerging before our eyes, hummingbirds darting over our heads—it’s time to take our dogs to the hills and soak up some splendor. Whether you live in Windsor or Jenner, finding a good dog hike nearby is not a problem. One of the best things about Sonoma County is that there is likely a good dog hike within a few miles of your neighborhood, no matter where you are. If your idea of a hike with your dog is an easy stroll through lush green grass, expansive oaks and tall redwoods and firs, then visit Ragle Ranch in Sebastopol. (During the summer, on Thursdays from 4 pm to dusk, you can enjoy the added bonus of food trucks offering a smorgasbord of ways to sate your appetite.) 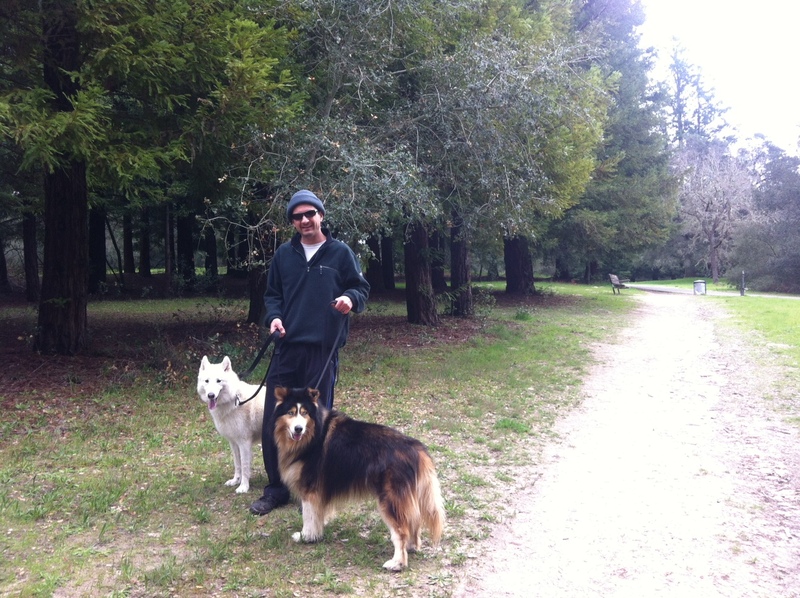 Last Sunday, my husband and I checked out the park with our pack (Pono and our new dog, Luna). It was quiet and serene. I’d never have guessed that many neighborhoods bordered it; I never heard a car’s engine speed by. There are many easy hikes in the park, complete with scenic and meadow views. We even spotted an edible mushroom (a bolete) when we were there! I already knew I owed a lot to Sonoma County Regional Parks. But I was surprised to learn that most dog friendly hikes in our county are within their parks. Seven out of the ten hike spots suggested below are in a Sonoma County Regional Park. Armstrong Redwoods State Reserve: 805 acres. Redwoods tower in this temperate rainforest. Creeks flow in winter. Birding; views of mountains and Lake Sonoma. Rolling grassland and creek views; birding. Lake and hill views. Wildlife includes geese and otter! Panoramic views with glimpses of Golden Gate Bridge from Gunsight Rock and Valley View Trail. This park contains 19 miles of trails. Joe Rodota Trail: 8.47 miles of paved trail from Santa Rosa (Prince Memorial Greenway) to Sebastopol. Golden fields of mustard at end of winter; distant hill views. Meadow, hill and some panoramic western Sonoma County views. Wildlife and birding observation; ocean views. 6.8 miles of trails. Birding and lake views. Last Sunday, we saw the America Bald Eagle again, across the river from our house. It was morning, coffee time. My husband Philip called me over to the window, and we watched it settle on the hill. The white head of the bird stood out clearly against the new green grass. Philip ran around the house trying to find the binoculars, letting me soak up all the time staring at the eagle. At one point, I was looking at an eagle high on the hill, at a fish jumping out of the water, and at a deer standing in our yard in front of the river. Three wild animals right there, all in the same moment! Philip handed me the binoculars just in time to focus on the eagle, watch it jump on something, then flap its wings and leap into the sky. It flew upriver. That made the third American Bald Eagle sighting for Philip this week in our Duncans Mills neighborhood. Last week, he saw a bald eagle flying in the thermals above a kettle of turkey vultures. It swooped down past the vultures, plucked its prey from the hill, and then flew south. It moved its prey from talon to talon in order to shake grass off, holding its prey captive all the while. On the next day, during a walk with our dogs, one flew right over him, over the tops of the redwoods. More and more bald eagle sightings on the lower Russian River have been reported this year, so many that birders are beginning to ask questions like these: Gualala has a nesting pair—is the same pair coming down here? Are they nesting? To answer these questions, we’ve joined with David Berman, Programs Director for Stewards of the Coast and Redwoods, and created a new online discussion board at Yahoo! Group. It’s called the Bald Eagle Watch (bewrussianriver.org). Our goal is to collect and record evidence of bald eagles on the lower Russian River. I’d like to think we have our own pair, and they are nesting, since my husband and I saw a pair back on “Canoozday” (my first 101 Travel Blog) and one of them had a large branch in its mouth. According to Jenner birders, a pair has taken up residence north of the estuary for many months out of the year, for some time now. When I was little, no one ever saw bald eagles. Not one of my parents or relatives had ever seen one. 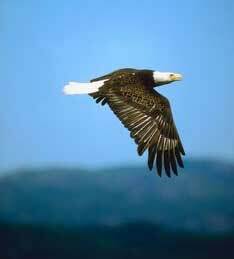 In the 1960s, the bald eagle population had gone down to 450 breeding pair. In 1967, bald eagles were declared an endangered species. But what was the population like in our nation like before Columbus arrived? Most ornithologists believe that every lake and river had bald eagles. They estimate that the bald eagle population was at half a million. Not many species have been strong enough to be removed from the endangered species list, but the bald eagle did so in 2007. According to the U.S. Fish & Wildlife Service, our nation now has an estimation of 9,789 bald eagle breeding pairs. California has an estimation of 200 breeding pairs. Imagine drinking sumptuous wine grown from vineyards just a few miles upriver, biting into a piece of foccacia laden with Point Reyes Blue Cheese and smoked salmon, and gazing over a verdant field dotted with sheep. When you stop for wine at Sophie’s Cellars in Duncans Mills, especially on Friday evenings, this heaven can be real. The wine tasting shop specializes in local artisan wine from Sonoma County, as well as local artisan cheese and bread. “This is where you can enjoy the moment,” I overheard a woman say. And enjoy the moment we did. Every Friday is Local’s Night, with nine wines being poured and gourmet hors d’oeuvres offered. Last Friday a friend and I tasted both the Paul Mathew Chardonnay 2012 and the Bluenose Zinfandel 2011. For $6 a glass, it’s a great deal. The Chardonnay was refreshing and fruity with lots of pear tones. The Zinfandel offered a rich, balanced bouquet with hints of blackberry and mocha. “I have never disliked any wine I have bought from Sophie’s,” a patron told me. From 4 pm to 7 pm, hors d’oeuvres are served (each plate is $6). It all looked so good, I had to try a bit of everything: Cypress Grove Humboldt Fog Aged Goatsmilk cheese and Point Reyes Blue Cheese, grilled marinated artichoke salad, Casa La Belle Baguette and Humboldt Fog Foccacia, smoked salmon with cream cheese and capers, salami with Herbes de Provence, and a smattering of nuts and dried fruit. We chose to enjoy our wine and food alfresco, near a cozy outdoor fire. If your dog is well-behaved, Sophie’s Cellars opens its doors to you. After all, the wine shop is named after Sophie, the owner’s cocker spaniel. From 6 pm to 7 pm, you also get the chance to meet local winemakers. During the last pour, spicy mayan chocolate nibbles from Sonoma Chocolatiers are often served. Owner John Haggard has worked in the food and wine industry for more than 20 years. 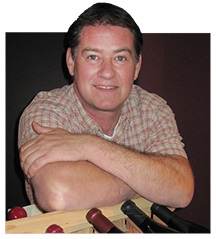 To be advised on superb Sonoma County wine, read his Sonoma County Gazette column, Wine Banter. For those of you who haven’t visited their new location in Duncans Mills, it’s well worth the trip. Planning a picnic on the coast and not sure what wine to pair it with? No problem. Just tell Haggard what kind of wine you like, what kind of food you are having, and let his genius do the rest. Reservations for dinner along the river? When you bring one of Sophie Cellar’s wines, you can get free corkage at 18 of Russian River’s fine dining restaurants. Sophie’s Cellars is just off Highway 116, at 25179 Hwy. 116. For more information call (707) 865-1122 or visit www.sophiescellars.com. It’s big, lights up blue at night, and is shaped like a Christmas present. When you open it, the gift of music floods from its doors. If you haven’t received the gift of the Sonoma State’s Green Music Center yet, make plans to do so soon. The Santa Rosa Symphony is the center’s resident orchestra, and the symphony is resplendent in its new home. In June 2013, the symphony’s innovative programming won them a First Place National Award for Adventurous Programming by the ASCAP (American Society of Composers, Authors and Publishers). This is their 86th season, and for the 2013-2014 season the symphony offers an American premier of Zhao Jiping’s Concerto for Pipa, an American premiere of a new work by Norwegian composer Ørjan Matre, and a world premiere viola concerto. In January and February, I was lucky enough to witness two of these premiers. In January, I enjoyed the East/West Musical Dialogue, featuring Mozart, Beethoven and the American premiere Concerto for Pipa performed by Grammy Award-nominated musician Wu Man. In 2013, Man was named Instrumentalist of the Year by Musical America. The event was aptly named, as it was a dynamic dialogue between the delicate but strong voice of the pipa and the soaring crescendo of the orchestra. The pipa is a lute-like instrument with four strings, and has been played for about two thousand years. The 25-minute Concerto No. 2 for Pipa and Orchestra was also important because the pipa music played was typical of the music Man grew up with in her native China. Just like so many family histories are now being preserved in writing, this concerto preserves her hometown’s history in sound. In fact, Zhao Jiping, a prominent Chinese composer who also composed Farewell My Concubine, wrote the concerto especially for her. The dialogue was so moving, the contrast so profound, the string instruments creating a tide of sound that rose like mini tsunamis, that it held the audience spellbound. I wasn’t the only one who felt that way. “I could see the movie,” I heard one audience member confide to her companion. In February, I enjoyed the Sons of the Fjord event, with compositions from Grieg and Sibelius, as well as another American premier, Resurgence, composed by Ørjan Matre in 2011. 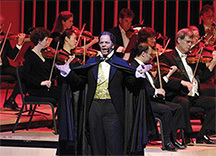 According to Santa Rosa Symphony music director and conductor Bruno Ferrandis, Matre’s intention was to communicate the idea of distance and time. In this piece, woodwinds were placed strategically around the hall, so that when the musicians played the woodwinds, the sound came from the front, back and sides. Brass instruments were played off stage. Even the motifs were intentionally designed far apart, in order to convey the sense of time passing and distance reached. The surround sound of this piece was so good that for several minutes, I felt as if I was inside a gigantic Tibetan Singing Bowl. After that came a deep rumbling, like an approaching train or earthquake, created by the tam-tam drum and percussion of musicians’ fingers beating against the strings of the double basses. The music met its mark—creating a sensation of suspense and travel. What else is in store for this season? In late March, a world premiere viola concerto by Behzad Ranjbaran will be performed by Paul Silverthorne. For families, the Santa Rosa Symphony partners with the Sonoma Paradiso Foundation for the Family Concert Series, with miming featured in The Mozart Experience and Classical Kids Live! in Beethoven Lives Upstairs. And that’s just part of the symphony’s line-up. The Green Music Center offers something for everyone, from the Vienna Philharmonic Orchestra to classical guitar to showcasing stars like Jason Mraz. To extend the gift of a musical night, I recommend arriving at the center early and having drinks and/or dinner at the Prelude Restaurant, located to the side of the center. Concert Conversations with the Conductor are also worth it, during which the audience receives insight to the pieces about to be played. These conversations begin one hour prior to each performance and are free. for each of us will be shelter for the other. for each of us will be warmth for the other. for each of us will be companion to the other. and our seasons will be long and good. My mother spoke this prayer during my wedding ceremony, seven years ago. In reading it today, and thinking of Valentine’s Day around the corner, I think it applies to many relationships in our lives—spouses, best friends. And canines too. All dogs are special, but some become true companions. Living in Sonoma County (home of a surplus of dog-friendly wineries, hotels, restaurants, parks, kayak outfitters and beaches), we know how much the love of a dog can enrich our lives. It’s been about a year since my dog Rainbow died. He was a big white Samoyed German Shepherd. I knew from the moment I met him that he was one of a kind. During the 11 years he was with us, Rainbow would sometimes look at me for long periods of time, searchingly. And not just to look at what morsel was in my hand. But thoughtfully. If I was sad, he would walk over to me on his fluffy polar bear paws, and look me square in the eye. If a tear ever dropped, he’d lick it off my face. Then he’d keep licking, until a smile began to form in the corner of my lips and I pushed him away. Sometimes, at the end of a hard day, I’d bury my face in his furry neck. He didn’t mind. He’d stay still as long as I needed him to. Then he’d circle three times and settle himself right up against me, in a giant ball. Sometimes he’d stand next to me, leaning into me for a long, long time. That’s how dogs hug, I’m told. It felt like a hug, warm and cuddly. 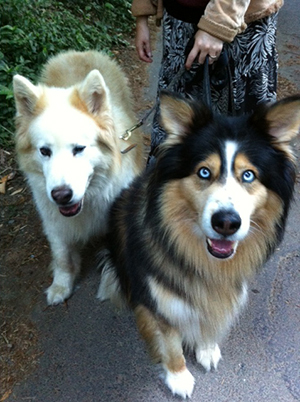 Five years ago, we moved from Hawaii back to Sonoma County, with our two huskies in tow. Hawaii offered Rainbow treasures like hanging out in caves and dog paddling under waterfalls, but Sonoma County was good to him too. He smelled redwoods for the first time. He loved swimming in the Russian River, his big white paws expanded like a polar bear. We even took him canoeing, which he wasn’t so fond of, since there wasn’t enough space for him to circle before settling down. He waded in the surf of Sonoma County’s beaches. It was great fun running with him through the frothy waves sliding up the sand. From our deck, he observed animals he had never seen before—blue jays, ospreys, squirrels, bald eagles. He protected us against raccoons and once, a mountain lion. One of my favorite dog-friendly outings was (and still is) to get up early and go to the Russian River estuary. You can get an excellent cup of coffee from Cafe Aquatica, and perch on the round wooden platform, gazing out on the glassy morning waters with your dog by your side. A time or two, I’ve seen sunrise and it is worthy of magazine covers. If you’re hungry, there’s plenty of organic home-made goods. (I recommend all the quiches, the albacore salad and the salmon melt.) Often, the cafe will have live music. There’s nothing like hearing flamenco Spanish guitar while breathing in the tranquility of the estuary, watching mists move across the water, all the while with your dog curled up by your feet. 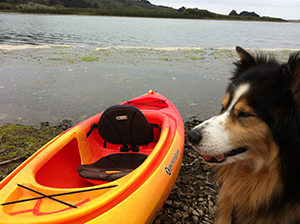 If your dog likes the water, he can go with you on a kayak ride (you can rent a kayak from WaterTreks EcoTours) into the estuary and around Penny Island. Or drive over the river and around the hill to Blind Beach, south of Goat Rock. On that beach, you can view Arch Rock (the backdrop for scenes from the movie Goonies) while taking your dog for a run. Other top ventures with your canine: Monte Rio beach at sunset time to view the birds (think Osprey, Starling, Common Merganser, Great Blue Heron) or Armstrong Woods at all times. There are so many other treasures in Sonoma County, too many to name. It seems much longer than a year since we’ve lost Rainbow. Today we will release some of his ashes. Today I’ll take my dogs to the forest, to walk the trails that Rainbow once walked. 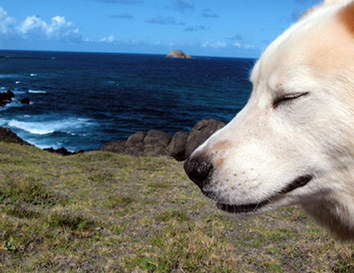 Today I’ll bring our dog Pono and our new dog, Luna, to revisit the special places of Sonoma County. Maybe the sun will slant through the trees like it did when we walked here last. Maybe a memory will come so clear I can touch almost it, like when Rainbow would charge the hill and my son would chase after him. Think about this—if non-verbal communication makes up more than 90% of our communication (as studies show), what kinds of conversations are we having with our dogs? What does having companionship with them teach us about others? Are we more patient, kind, peaceful, playful? Healthy and happy? Research shows that cuddling with our dogs give us a boost of the hormone oxytocin, known for reducing blood pressure and levels of stress-inducing cortisol. But now research shows this is a reciprocal relationship, because dogs get a boost of oxytocin when they cuddle with us too. So many of us have stories about our dogs, especially those companions that no longer grace our lives. If you have a story, and wish to share, we’d love to hear it. One of my favorite places in Petaluma is the downtown small square on Petaluma Boulevard, between Washington Street and Western Avenue. The ambiance is just right, with weeping willows, a splashing fountain, and the Petaluma River only yards away. Petaluma Pie Company, situated in the corner of the courtyard. Upon entering the pie shop, one of the first things I noticed was the humming. But it wasn’t bees making the sound, it was people. “Mmmmmm. . .mmmmmm.” I asked owner Angelo Sacerdote if he and co-owner Lina Hoshino hear that sound a lot. What’s also excellent about this pie shop? Most of their ingredients are organic and grown locally. “If it’s grown locally, we try to buy it locally,” Sacerdote said.Business has been good. Petaluma Pie Company has expanded their business and are now in their fourth year. When I was handed my warm Sour Cream Apple pie, a two-year-old girl looked up at me. “Nice pie!” she said, looking very serious, observing my pie. “Yes!” I agreed. My apple sour cream pie was delicious, with Fuji and Pink Lady apples. Sweet but not too sweet. For those who decide to follow my journey, I’d recommend making the night a progressive dinner of sorts. Start with a savory pie, like the Mushroom and Goat Gouda or Organic Chicken Pot Pie. Share a pie or order your own mini. One mini pie is more than enough as an entree. Next on my list—some wine. I walked past the fountain and rounded the corner to step into Vine & Barrel. The shop specializes in fine, rare and boutique wines with 90 point ratings and higher. These include international wines, Sonoma County and Petaluma wines. There are six beers on draft. There’s food too. A full menu of tapas and charcuterie is offered, such as Goat Cheese with Fruit and Nuts or the Grand Platter. Owner Jason Jenkins poured me a glass of 2011 Americana Petite Syrah that was out of this world. It was like drinking liquid satin or European sipping chocolate. It left a warm feeling in my mouth, the taste free of tannins, the bouquet nicely blooming. The true treasure of this gem may be the wine club. At only $35 per month, members receive two hand-picked bottles by Jenkins, and receive full-time happy hour prices plus a 15% discount on all the wine. That’s right, all the wine. For my last stop of the evening, I walked across the street to Viva Cocolat. This artisan chocolate shop offers creations from 30 local, national, and international artisan chocolatiers, as well as a full espresso bar. Owner Lynn Wong began the shop because she wanted to bring in good chocolate and educate others. “Nobody tastes chocolate,” Wong said. “Everyone eats chocolate, but nobody tastes it. For me, it’s not the quantity, it’s the quality.” Customers tell Wong that she has changed their relationship with chocolate. Some of them admit they dream about the chocolate from her shop. “It takes all five senses to taste chocolate,” Wong said. “Good chocolate, just a little will sustain you.” For the hot chocolate, Wong only uses Belgian chocolate. “I think about American hot chocolate, and how it is milk-based. European style is like a melted chocolate bar, like melted pudding.” When the cups and saucers arrived for my tasting, the cups were warm from the hot chocolate inside, just perfect for drinking. One was the traditional European style and one was spiced with cinnamon and cayenne. Atop each was a dollop of fresh whipped cream. On the side of each saucer sat a tiny spoon. “Why the spoon?” I asked. This February 9th will mark Viva Cocolat’s 6th year anniversary. In 2012, the shop was named Best Chocolate Shop by the North Bay Bohemian.For Valentines there will be hanging hearts in the back room, mood lighting, an intimate atmosphere fitting for a decadent selection of aphrodisiacal chocolate. Reservations are required. If you don’t decide on sipping hot chocolate, you might try a pot of chocolate fondue. Dark, milk and white chocolate is available. The fondue has dipping edibles such as strawberries, cookies or cream puffs, pretzels, or fruits. “Which one would you pick?” Wong wanted to know. “The spicy chocolate,” I confessed. The European style sipping chocolate was excellent, creamy, caressing even, but the spicy sipping hot chocolate was spicy as well as velvety sweet. It dipped me as if in a dance, the warmth crept up, and nearly overwhelmed. I did need to use the spoon, after all. It seemed necessary to scrape up every last drop. For the final section of this walkabout, I took a stroll behind Viva Cocolat to the canal. When you walk on the bridge spanning the canal, the string of lights from the restaurant reflect in the water, and you can’t help but think of Venice. If you squint just right, you could be there. Glorious food and wine at your fingertips. All that’s missing is some harpsichord music and a floating gondola. My recommendation for those recreating this journey with romance in mind? Finish the evening here, on the bridge spanning the canal, and seal the night with a kiss. When you walk through Armstrong Woods, you often see people with their eyes fixed to the sky, necks craned, catching silhouettes of treetops towering overhead. In places like this, you breathe deeper. A feeling of gratitude descends, for the trees and all they give, for their beauty, and for the stewards who protect them. Who are the heroes of this land? Who helps keep your parks open? Who preserves the open spaces along the Russian River, from the redwoods to the ocean? Who are the guardians of the largest harbor seal rookery in Northern California? Your hero is the Stewards of the Coast and Redwoods. Without Stewards, many of your parks would not be kept open due to state budget cuts. 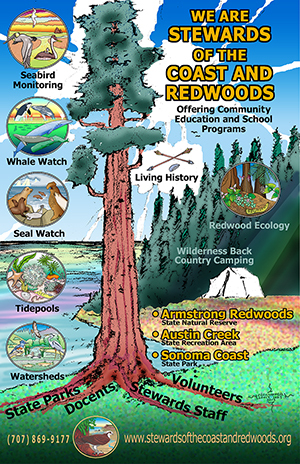 This non-profit organization protects and restores Armstrong Redwoods State Natural Reserve, Austin Creek State Recreation Area, Willow Creek Watershed and Sonoma Coast State Park. It supports the Armstrong and Jenner Visitor Centers. But that’s not all they do. Stewards offers community education and school programs, nearly 20 of them. With such a diverse program menu, there is something for everyone. Additionally, the new program Explore Nature through Science (ENTS) extends outreach to high schools. In this program, students will camp at Bullfrog Pond or Pomo Canyon Campground and learn environmental education through hands-on science. There is also a new California Naturalist Certification Program. Each year,a million visitors come to the Russian River Parks. Docents of Stewards are in direct contact with 101,000 people every year, educating and advocating conservancy. Each year, Stewards educates 5,000 school children. How much does it cost the children? For most programs, it’s free—thanks to donations and fundraising by Stewards’ members. Executive Director Michele Luna has been with Stewards for 20 years. “Many programs came into existence from citizens and volunteers seeing a need and coming to us to see what we could do,” Luna said. Whatever your interest, Stewards has an adventure for you. Wish to observe pinnipeds? That would be Seal Watch, one of the oldest programs. Maybe wilderness back country camping is more your thing? There’s that program too. Do you like hiking? Try Trail Cruise, and work on trail restoration twice a month. Curious about tide pools, ecology, or marine debris? Those programs exist as well. Programs and events are funded through fundraising, grant writing, and lots of volunteerism. Volunteers are the lifeblood of Stewards. The organization for the people is made possible by the people. Armstrong Woods is supported by more than 500 volunteers. The Citizen Science Monitoring Program consists of nearly 300 volunteers. Stewards originated from citizens’ response to the 1985 sewage spillage in the Russian River. How would the harbor seals react? People were concerned. Luckily, the seals were smart and left. When the water was clear again, they came back. Through tracking the seals’ movements, Jenner activists learned that seals were more adversely impacted by unleashed dogs than the sewage. Thus began Seal Watch. Stewards became a cooperating association working in partnership with State Parks. Stewards hosts events as well. Family Day was created so students can bring families back to the park and share what they have learned through the seasons. There are learning stations and free booths. It is a bilingual event. Luna and Programs Director David Berman are excited to see a younger demographic of volunteers. Groups of kids from the Rotary Club and Club Scouts are now volunteering. Luna and Berman hope that the experience will inspire children to a lifetime of volunteerism. Your hero has plans. Stewards is working to reopen closed camping areas on the Sonoma Coast. A new Mobile Marine Education Center is in the works. The vehicle will be similar in design to the Whale Bus of the Marine Mammal Center and include interpretative displays. It will travel to schools. Soon, Stewards will have an expanded presence at Bodega Bay. When you volunteer with Stewards, it is your park that you protect and nurture. No experience? No worries, training is provided. To schedule a group visit, volunteer, or for more information, call (707) 869-9177. Another great article by Sarah Amador. To learn about the Stewards was very beneficial. I look foward to Sarah’s next article. Thank you!!!! These days, living on the Russian River is like watching an episode of Wild America. Our home borders the river, about two miles from where it enters the ocean at Jenner. We get to watch a smorgasbord of wildlife. Otters, seals and sea lions, Osprey, bobcat, and most recently, bald eagles. Last weekend, I woke to the sound of sea lions barking just beyond our balcony. Over a steaming cup of coffee, I watched pairs of them splash and dive in the shallow river, hunting hundreds of migrating salmon and Steelhead. The wakes of the sea lions were so big they spanned the river, touching the sides of both banks. Bald eagles have taken up residence here too. My husband and I watch them soar and listen to their calls. A few weeks ago, from the vantage point of our canoe, we spotted them for the first time this year. We may even have witnessed them building a nest. The name of our canoe is Canoozday. It’s a beautifully crafted wooden canoe, nearly 70 years old. On a warm Tuesday afternoon in December, we took it out. The sun shone and the breeze was cool. The river was high, at least four feet higher than the previous week. We put the canoe in the water and paddled downstream, staying in the warmth of the sun. The canoe sliced through water dappled with sunshine and we headed to our favorite spot, a bird’s sanctuary not far from where we live. “Did you bring the camera?” my husband asked. “Nope,” I said. “We’ll just have to remember it.” No Blue Heron or Osprey today—the sky strangely absent of birds. Lots of birds on the water. Coots, Goldeneyes, one Mallard. As we neared, they made staccato splashes and the wings of the Goldeneyes whistled. The sun slipped behind the hill and lit the rusty trees till they were golden. The golden hue continued into the water, with the reflection of the leaves and rising hills. After a while, we turned around. That’s when we saw two bald eagles soaring the treetops. Dark swaths of body and wing. Flashes of snowy head and feathery tail. One split from the other to get a branch from a redwood tree. It grasped one almost as big as it, flew a short distance, and then dropped it into treetops that formed a V. “Is it building a nest?” I whispered. My husband nodded his head in agreement.The bald eagles soared in circles, crossed each other’s paths, rose higher. They glided high until we lost sight of them. We watched them soar for 30 minutes. They never once flapped their wings. It was a good day to be on Canoozday. It was a good day to live in West Sonoma County. Comment: Beautifully written. I felt I was there with you in Canoozday on a very good day in West Sonoma. Comment: Loved this blog. Sarah is an excellent writer who really knows how to translate her experiences so the reader can “go places” with her. Comment: Wonderfully evocative and beautifully written. I want to see those bald eagles.